What is a Public Housing Authority? With this method, the PHA owns and manages properties. Approximately 1.2 million families reside in public housing around the country. Properties range from single family homes to high-rise apartments. This method allows families to use a voucher anywhere a landlord is willing to accept it. The housing authority will subsidize the rent and utilities. Voucher programs serve about 3 million families nationwide. Beyond these core services, PHA’s offer a variety of ancillary community services in support of their housing developments. There are a number of community partners with the PHAs. The local, state, and federal government all pitch in to help PHAs achieve their goals by ensuring community development will lead to larger community revitalization. Some Community Development Corporations may also give aide; grants and tax credit applications require community support. In Northeast Ohio, we have 15 PHAs throughout the region and there are 78 PHA’s in Ohio. Take a look at the NEO101 Presentation to learn more. Eastgate Council of Regional Governments, a NEOSCC Board Member, and the Western Reserve Independent Living Center (WRILC) are working together to help improve the delivery of transportation services and options for older adults, and persons with disabilities. The WRILC is a non-profit community based non-residential center dedicated to empowering individuals with disabilities. The two surveys below will help with the four-county coordinated transportation network. Download the surveys for a chance to win a drawing that is sponsored by the WRILC. To take the transportation provider survey, please click here. To take the transportation services survey, please click here. Interested in more information on Eastgate, access their newsletter here. Admit it: You love Northeast Ohio. You love the people, or the history, the museums, the food, or the parks and the sports. For all of us, there are aspects of our region about which we are proud, unique qualities that make it a great place to live. We all want to see the things that we love about Northeast Ohio thrive and grow, just as we would like to see the challenges facing our region addressed and put behind us. The Northeast Ohio Sustainable Communities Consortium works to help residents preserve and build upon what we value, and to fix those things that are challenging — on a regional scale. NEOSCC is a growing member-led collaboration of public agencies, elected officials, philanthropic and nonprofit organizations, colleges and universities and community members. Our collective work will serve as the foundation for the development of Vibrant NEO 2040, a regionwide planning and engagement effort convened by the consortium to spur the development of the vision and tools that will help Northeast Ohio become a more sustainable, resilient and vibrant place to live and work. To continue reading visit cleveland.com. Share your thoughts: How could Northeast Ohio take better advantage of its rail infrastructure? As a conclusion to the first half of our 12 Counties in 12 Months program, NEOSCC will be taking our board meeting to Summit County on Tuesday, November 27. This will cap a six month tour of Mahoning, Lorain, Stark, Cuyahoga, Ashtabula and Summit. To avoid potential weather difficulties in the winter months, we will be restarting the tour in April with the remaining six counties. NEOSCC counts many organizations as part of our board member organizations: the City of Akron, Summit County, Akron Metropolitan Area Transportation Study (AMATS), Akron Metropolitan Housing Authority, Akron Urban League, Summit County Health District and NEFCO. Prior to the meeting, Summit County leaders will introduce NEOSCC board members to local assets and successful projects via a bus tour. While traveling around the county, the group will discuss the Summit Lake Community Center, Bridgestone, The Goodyear Tire & Rubber Company, the University Park Alliance, The Austen BioInnovation Institute, Stan Hywet Hall & Gardens, Highland Square, Downtown Akron and the National Inventors Hall of Fame STEM School. Our meeting will take place at the Akron Urban League at 1:00 pm. All of our board meetings are open to the public, so if you have time, please stop by. With Thanksgiving just a few days away, we wanted to share a recent post from the Good website proposing a 100 mile Thanksgiving challenge. Happy Thanksgiving! Back in June, NEOSCC took its board meeting to Mahoning County. As part of our 12 Counties in 12 Months Program, the NEOSCC Board had an opportunity to tour some of Youngstown’s unique assets as well as some of the redevelopment work that is occurring. Part of the tour was led by Youngstown Neighborhood Development Council (YNDC), a multifaceted neighborhood development organization launched in 2009 in partnership with the City of Youngstown and The Raymond John Wean Foundation to catalyze strategic neighborhood reinvestment in neighborhoods throughout the city. YNDC highlighted some of the neighborhood revitalization work during the tour. We wanted to showcase a recent YNDC publication: Lots of Green 2012 Impact Report. YNDC’s Lots of Green program is a nationally-recognized, vacant land reuse strategy implemented in Youngstown neighborhoods by the YNDC and multiple partner organizations. The program engages residents and volunteers through several programs, including Iron Roots Urban Farm, Market Gardener Training, Community Gardens, Green Jobs Training, Lots of Green 2.0, People’s Garden, and Basic Land Stabilization, in reclaiming all vacant land in strategic neighborhoods, transforming the physical fabric of the neighborhood and increasing neighborhood pride and ownership. In 2012, the YNDC developed Iron Roots Urban Farm that put 1.7 acres of vacant land back to productive use, created jobs for 7 individuals, operated a second year of the Market Gardener Training Program with 25 participants, and trained 14 young adults through the Green Jobs Training program. The organization continued to oversee 5 community gardens,and created 13 new gardens through the Lots of Green 2.0 and People’s Garden microgrant programs. In total, the YNDC implemented vacant land stabilization projects on 90 new lots (14.4 acres). Read the entire report (pdf download). Across the state of Ohio, communities are utilizing shared services to improve their operations and reduce costs. Learn more about these opportunities at the upcoming Shared Services Expo on November 27 at Ideastream from 8:00 to 2:30. The program will highlight successful shared services programs and provide practical advice to those interested in collaborative shared service projects. Keynote speakers include Former U.S. Senator George Voinovich, Cuyahoga County Executive Ed Fitzgerald and Controlling Board President and Policy Advisor Randy Cole. Interested in finding out what shared service collaborations are already underway in the region before the Expo? Check out EfficientGovNetwork, a sponsor of the Expo, for details. Act: Attend the Cleveland APA Planning and Zoning Work Shop Today. Northeast Ohio has a story. Help us tell it. You are an expert on your piece of Northeast Ohio. No one else knows your experiences better than you. As part of the Vibrant NEO 2040 initiative, we want to tell stories about what makes Northeast Ohio such an extraordinary place to call home. Through these stories we can all have a better sense of what we need to create a more vibrant, resilient and sustainable present and future Northeast Ohio. MyVibrantNEO wants you! In fact, it IS you! What do you love about our region? What needs work? We started the MyVibrantNEO campaign to help connect Northeast Ohioans as part of a conversation about what makes each community great, and what could make each community better. Visit MyVibrantNEO to learn more. 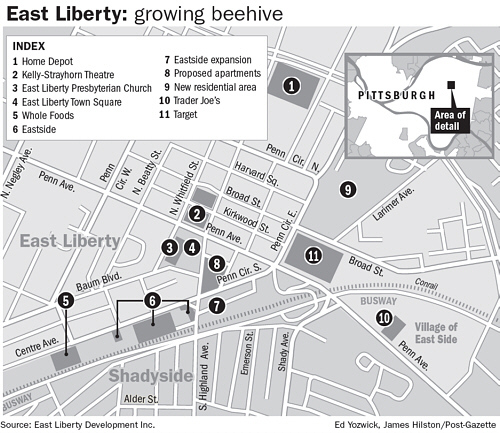 As part of a grantee peer-to-peer exchange in Pittsburgh this week, we were given a tour of the East Liberty Neighborhood redevelopment project. Our first community plan, A Vision for East Liberty, produced in 1999, helped guide our neighborhood’s recovery from urban renewal efforts. Recognizing the success that followed the 1999 plan, we decided to come together again to include new and old neighbors and expand and refine our vision. Through a process of community meetings, a broad range of people who live, work, shop, play, worship, and invest in East Liberty shared our love for the neighborhood, our concerns, and our dreams for its future. The guiding principles below, which emerged from these meetings, will guide residents, developers, organizers, and stakeholders through the ever-evolving process of planning and development toward our community’s goals. Over the last 12 years, 1,400 high-rise public housing units have bee replaced by 450 new mixed-income units. The neighborhood has also attracted national retailers Home, Depot, Whole Foods and Target. Download a copy of the 1999 Community Plan, A Vision For East Liberty, or the 2010 Community Plan,Many Voices Driving Neighborhood Change. What’s missing from our Library? In developing our Conditions and Trends Platform, NEOSCC staff, Consortium members and over 150 subject-matter experts distilled information from public policy plans, planning initiatives and other resources from across the region into a comprehensive set of findings about our region. These findings are the heart of this Conditions and Trends Platform. They are not a definitive list; instead, they are a starting point for understanding our region. And there are no solutions or recommendations within these findings; any recommendations resulting from NEOSCC’s work will be developed in collaboration with Northeast Ohio’s leaders and residents. This information included 100′s of planning efforts completed and underway throughout Northeast Ohio. NEOSCC has compiled pre-existing policy plans and initiatives that are available across the Ohio region into a searchable database. Our question to you is… what is missing? Visit our Vibrant NEO 2040 Library and let us know. Share your thoughts: Northeast Ohio populations experience significantly different health outcomes that correspond with disparities in housing quality, education attainment, economic opportunity, and transportation access.